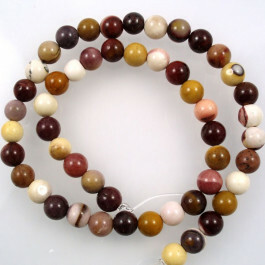 A-Grade Mookaite Stone Round 8mm (~50pce Strand) - 40 cm /16'" Strand . A-Grade Mookaite Stone Round 8mm (50pce Strand) - 40 cm /16'" Strand . Rich, earthy tones of mustard yellow, mahogany red, beige and brown strongly combined. Named for where it was first found - Mooka Creek on the west side of the Kennedy Range in Western Australia. Held by Australian Aboriginals to be a powerful healing stone that bestowed strength. Sometimes incorrectly spelt as mookite, moukaite and moakite. Said to be a physically stabilizing stone, helping to balance the internal and external. A very positive stone. Mookaite is also known as Australian Jasper. Usually heat treated to enhance colour.